Apparently a late night of partying does a body good. 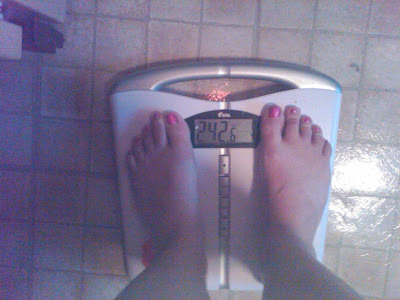 I was really worried that I would not lose anything this week so imagine my surprise when I stepped on the scale. For some reason it took me about 10 minutes to get this picture this morning so I'm sorry for the blurriness. everyone I took you couldn't read. The totals up to date. 23 lbs. total, this week was a 2.6 lb. loss. So yeah! I happy there was a loss at all.